There was a time when Maduluwawe Sobitha Himi did not appeal to the minorities the way he did at the time of his death. Some may still have reservations about some aspects of his past. The recurring challenges of civil governance that brought us together fifteen years ago, however, developed into a close friendship and enabled me to understand, respect and appreciate him as a courageous and timely gift to us all. Among Sobitha Himi’s several contributions to the life of the nation, two outstanding thrusts speak clearly to religion and religious leaders in particular. He reminded us that if religion dares to offer solutions to our complex human challenges, it is compelled to engage with the harsh realities of life. For Sobitha Himi, human crises were far too crucial to be left to those whose main objective and delight is power. This is why for him, the role of sound religion, called instead to primarily serve the common good, was to expose and distance itself from the snares of power and work for a just and transparent society. In Sobitha Himi’s world view there was no room for religion to either withdraw from social realities or turn into a weapon of hatred, violence and division. In his engagement with social issues, Sobitha Himi demonstrated a spiritual rhythm that religious leaders are to take note of. He listened with sensitivity to the grievance and hardships of the people and applied the Dhamma to what he heard. In other words he responded to the hypothetical but helpful question, ‘what would the Buddha say and expect?’, if and when confronted with these contemporary challenges. The first beat of this rhythm came spontaneously as he had his ear to the ground and was connected with people, and he exercised the second through his remarkable ability to translate the wisdom of the Dhamma into a language that embraced all; a skill that all religions are to acquire. In other words he preached the Dhamma and talked politics at the same time. This is why he was understood not only by Buddhists, but by Hindus, Muslims, Christians and the secular world as well. A spirituality that helped him to stay faithful within these thrusts was his disregard; almost contempt, for status and position. By rising above these enticements that obsess and destroy so many, he exposed the fallacy that political office is the pinnacle of life. He taught instead, that losing ones’ self for the good of others’, is the most noble option available to humans. This is why his life was a source of encouragement to the countless unsung Sri Lankans, content to live with dignity and integrity wherever they are placed. In-spite of several worrying set-backs in todays’ civil governance, we are now able to breathe, largely because of Sobitha Himi’s pro -people influence. His visionary leadership certainly saved us as well as those in divisive politics, from the extremes that divisive politics can take us to. For many Christians, he was truly a prophet in our midst. These were persons who in the tradition of the Bible stood for the cause of the oppressed against unrighteous rulers. They were often contrasted with the false ones, who instead sought favours and goodwill from deceitful regimes. This prophetic model of leadership that inevitably brings change, respite and fresh opportunities, offers a lasting lesson. It teaches that the way to national reconciliation and integration after a substantial period of arbitrary violence and entrenched impunity, is to be discerned in a collaborative and sustained response to social injustice. To stay on this path is to honour our common humanity as well as the man who brought honour to the yellow robe. Sobitha Himi’s early ten-point proposals for democratic change did not refer to the Tamil problem. When this was pointed out, he patiently explained that it would be addressed after some degree of political and social stability had been realised. He returned to this obligation, after January 8th, to influence a decision of the Congress of Religions to once again revisit this long overdue grievance, and also came up with a novel approach on how this could be done. Rather than meet political leaders or the media separately, as was the practice, he suggested that we should engage the Ministers of Justice and Resettlement together at an open media conference. At this conversation at the ministry of justice in early April this year, the Congress of Religions called for and queried the delay in justice for the Tamils of our land. Throughout the conversations Sobitha Himi was his typical, charismatic self, urging that judicial action against Tamil detainees be expedited, that those without charges be released, that land acquired from Tamil civilians be returned and that details of missing persons be made public. His passion on that occasion was as strong as his passion to liberate the country from the powers of the executive presidency. May his memory lighten our darkness, convert us into disciples of the truth and bring us peace. With Peace and Blessings to all. Rev Sobitha was an another golden son of the country who fought to the end mostly even not caring his own health. He has nothing against non-buddhists. His movements were backed by all walks of life across the country and even being from foreign soils. He could get on with any kind of regligious, non religious men and women. That we should all learn from him. His legacy is unique to him. Had his movement been not active, nothing would have been close to the values that we the people enjoy since 08th of January. He has nothing like against personalities but systems. He never respected and kind of thugs or criminal minded men such Rajapakshes. His fearless nature gave all other pro democractic movements to consolidate their views. May you attain Nirawana ape all beloved hamuduruwane. BBS and the like other barbaric pseudo monks should learn alot from Rev. Sobith Thero. BBS barbaric Ghansara should be brought before the courts for his barbaric acts against Muslim community during the last few years. It is high time man to be caught- for his personal gains only Ghanasara is hidden behind Siwura. His crminal energies are even beyond those of recent Paris attackers. See how he behaved on the stage in Aluthgama constantly attacking those innocient people. Had not he held a speech of that kind then, nothing would have occured destryoing the people. That was a murderous act – deliberatly supported by Rajapakshe Regime. Samuel, even though you praise Ven Sobhitha, you have never learn nothing from him. You know only shout at Rajapakshes. Should not you think of something constructive other than just bashing Rajapakshes. Instead of leveling bogus praises like “ape hamuduruwane” etc., learn from him the value of non-hatred which will be good for your personal health as well. Have you learnt the value of non-hatred from him? Do you practice it 24/7/52? If so since when? Do you still have respect for Gnanasara the saffron clad thug? A Great Son of Sri Lanka who had Served the Dhamma, for to be exposed the best principle Dhamma beholds very timely. May Maduluwawe Sobitha Himi Attain Supper Nibana. Yes, Ven. 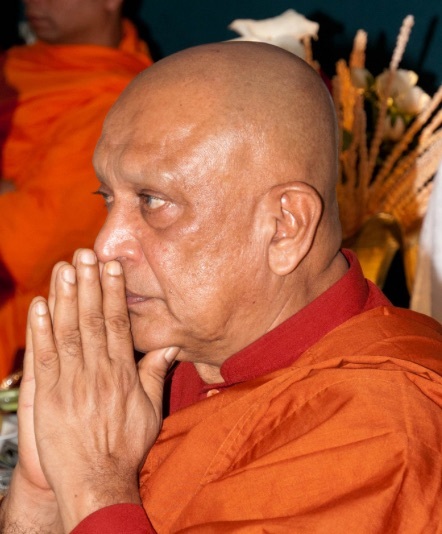 Maladuwe Sobitha Thero, was truly a gift to All Sri Lankans, ambply demonstrated during the past 5 years, especially the 12 months before his departure. May Ven. Maladuwe Sobitha Thero achieve Nibbana. I believe Ven Sobitha did what he could do As a human in this life. Since he could not achieve more than that or what he really wanted to this country, karma decreed he be born as a deva to take care of this country from a higher level where he will not be frustrated by actions of selfish politicians. As a deva he will guide these rulers on the right path. We as srilankans are not unlucky. Our beloved hamuduruwo will safeguard us from evil politicians. Ven. Sobitha was a champion who fought for the liberation of us not from the white sahibs but from our own brown sahibs. All of us pray to the good Lord to let him rest in peace. [Edited out] Chikera jumping on Shobitha bandwagon………. You had never spoken of Shobitha before. Why now? because your prayers were answered by Shobitha???????????? Leave Shobitha to rest in peace. We cherish the memories of Ven. Sobhitha Thero for his national contribution towards a change in political culture of the country. We have also noted that he was no fire-brand political monk who indirectly espoused hatred and violence but modesty and moderation. It is heartening to hear from none other than the Emeritus Anglican Bishop of Colombo of Ven. Sobhitha’s application of Dhamma to contemporary problems. He knew who and what politicians are and had the courage to call a spade a spade. He criticized the culture in the Rajapakse regime that ultimately was voted out of office and Rajapakse was his one time ally. He of late was critical of the jumbo cabinet formed in the name of a national government. What is less spoken about is the very same persons who today benefitted out of Ven. Sobhitha’s movement were his assailants when Ven. Sobhitha had to call them a spade a spade. Nevertheless friend or foe (these classifications being utterly impermanent) they all respected Ven. Sobhitha and that alone is testimony of his contribution to this nation and its society. If I remember right Prof:S.J.Tambiah-Distinguished Anthropologist-Harvard and onetime Cricketer-STC, in his book Buddhism Betrayed had this monks photo in the cover of the Book.He has been celebrated in Death notwithstanding his earlier views by onetime Warden -STC!